The season to be jolly is almost upon us but Surviving Christmas with the Relatives could turn the most festive of spirits into a grim-faced grinch. Pitched somewhere between a half-hearted Outnumbered seasonal special and a lacklustre Alan Ayckbourn play, this marks the strangest of returns for Fatal Attraction screenwriter James Dearden, whose last directorial effort was Rogue Trader almost 20 years ago. A desperately old-fashioned affair, this has an odd oil-and-water mix of uninspired farcical mishaps and darker dramatic incidents. That means exploding ovens, tipsy vicars and Viagra jokes rub shoulders with the tale of a troubled young man struggling to confront his drug addiction. Miranda (Gemma Whelan) and former architect Dan (Julian Ovenden) are the city slickers who have hitched their future to a Good Life-style dream of a fresh start in the country. They have three children, chickens and a turkey called Gobbles. The reality of their dream is a building site of a home, a leaking roof and doubts about the wisdom of their decision. 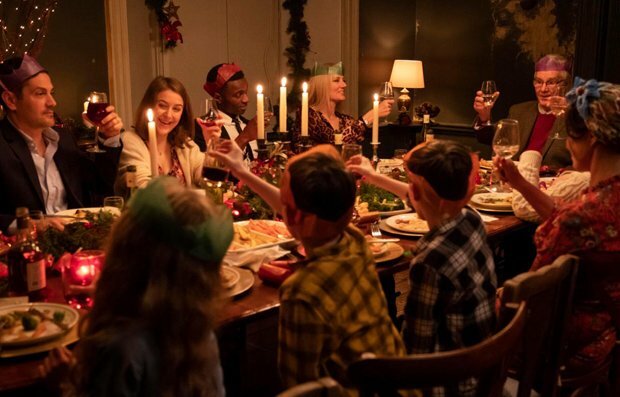 That doesn't stop them inviting 15 family and friends to Christmas lunch – including Miranda's TV star sister Lyla (a steely Joely Richardson, adding a touch of class), ailing uncle John (James Fox), lovelorn friend Vicky (Ronni Ancona) and a small brood of children. The stage is set for old family feuds to bubble back to the surface, while amorous misunderstandings, holiday romances and bitter resentments get their traditional airing. It unfolds to a blandly unadventurous soundtrack that ventures from Chris Rea to Tchaikovsky via Doris Day. The cast is amiable enough and try their best to inject some life into the proceedings but the supposed comic chaos struggles to raise a smile, the relationships fail to ring true and it all feels hugely underwhelming. The result is more ho-hum than ho ho ho. General release from Fri 30 Nov.
Miranda (Whelan) and Dan (Ovenden) are trying for a fresh start in the country, and invite 15 family and friends to a Christmas lunch. Cue family feuds, holiday romances, bitter resentments, etc. Desperately old-fashioned and lacklustre would-be comedy, more ho-hum than ho ho ho.